The three-day tercentenary observance of the martyrdom of the Sahib-jadas and Mata Gujri began today with religious fervour and holding of an Akhand path at Gurdwara Jyoti Swarup Sahib. Bhai Baldev Singh, head granthi Gurdwara Fatehgarh Sahib, performed the ardas. On the first day of Shaheedi Jor Mela, a sea of devotees thronged Fatehgarh Sahib and long queues were witnessed at Gurdwara Fatehgarh Sahib and Gurdwara Jyoti Swarup Sahib. Gen S.F. 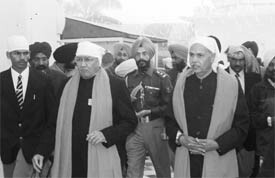 Rodrigues, Governor, of Punjab, also paid obeisance at Gurdwara Fatehgarh Sahib. Devotees poured in holding nagar kirtans and reciting Gurbani. More than 25 Lakh devotees are expected to pay obeisance, at gurdwaras here during the mela. The religious spirit has been maintained at the mela. For the first time, no shops, stalls, conferences or community kitchens have been allowed on both sides of the roads. Playing of loudspeakers, swings, circus, skill games, amusement games, putting up gambling stalls and sale of intoxicants have been banned and only Gurbani is being relayed from Gurdwara Sahib. Meanwhile, General Rodrigues today inaugurated an exhibition organised by the district administration, depicting the achievements of various government departments and other agencies. He visited various stalls at the exhibition. Later he released the special issue of a bi-monthly magazine, “Yuva Chetna”, dedicated to the martyrdom of the Sahib-jadas. He appreciated the efforts of the district administration in organising the tercentenary event in a purely religious manner. Hundreds of langars have been organised by all sections of society and also by NRIs for the devotees. The District Cultural Society, in collaboration with the district administration, has also organised Dhadi/kirtan darabr at the main pandal and an akhand path has also been started there. Free bus service has been provided to fetch women and senior citizens from naka points to Gurdwara Sahib. Free parking has also been provided by the district administration for the devotees. The main attraction of the mela with be a light and sound programme, “Sirhind Ki Dastan” being organised by the Public Relation Department. The second day of the mela will be marked by political conferences. However, the district administration has appealed to all political parties not to make political speeches and observe the event in a purely religious manner. On the concluding day of the mela, a nagar kirtan will be organised from Gurdwara Fatehgarh Sahib to Gurdwara Jyoti Swarup Sahib. A convention was organised by the Dal Khalsa here today to commemorate the martyrdom of the Sahibzadas. Addressing the convention, Mr H.S. Dhami, acting president of the party, criticised the Centre for its failure to find a respectable resolution to Kashmir and north-eastern states. Prominent amongst whose who addressed the convention were party vice-president Satnam Singh Poanta Sahib, general secretary Kanwar Pal Singh, executive members Sarabjit Singh Ghuman, Shinder Pal Singh and Dr Manjinder Singh, and former Akal Federation chief Kanwar Singh Dhami. Gurinder Singh Chahal and Gurcharan Singh Banwait from New Zealand and Canada, respectively, also addressed the convention. The women of the world should take inspiration from Mata Gujri, who first sacrificed her husband Guru Teg Bahadur, then her son Guru Gobind Singh and later all four grandsons and ultimately attained martyrdom for the cause of religion, community and nation. This was stated by Sushma Sawraj, former Union Minister, while addressing the first Istri Sammelan organised by the SGPC in view of the tercentenary commemoration of the martyrdom of Sahibzadas and Mata Gujri here today. The sammelan was dedicated to the martyrdom of Mata Gujri. The SGPC had called students and staff of all SGPC-run colleges. Mr Parkash Singh Badal, along with the SAD leadership, was present on the stage. None of the speaker indulged in mudslinging. Ms Sawraj said religions were facing serious threats from people having vested interests. Though our Gurus laid down their lives to protect the religion, the Hindu religion was again under threat as Kanchi Shankaracharya had been falsly implicated in a murder case, she added. Ms Surinder Kaur Badal demanded 50 per cent reservation for women. She highlighted the supreme sacrifice of the Sahibzadas and Mata Gujri. Bibi Jagir Kaur, President of the SGPC, said women had always remained on the forefront and not only shared responsibilities of men but also guided them from time to time. She stressed the need to check social evil of female foeticide. She said it was a matter of concern that women were facing the wrath of men and were being harassed, raped, burnt and sexually exploited. That all had been happening due to impact of westernised culture and vulgarity on electronic media. Mr P.S. Badal, the only male speaker, highlighted the sacrifices of Guru Gobind Singh and the Sahibzadas. He said in future the first day of the Shaheedi Jor Mela would be dedicated to Mata Gujri Ji and the sammelan would be a regular feature. He said “patitpana” among the Sikhs, particularly among youths, was a matter of concern. He said the SGPC had decided to set up World Sikh University at Fatehgarh Sahib, where world-class education would be provided particularly of the Sikhism. He urged the SGPC President to recruit women preachers. The holy relics of Sri Guru Gobind Singh, bestowed upon the forefathers of Punjab Chief Minister Capt Amarinder Singh, would be displayed for general public at Fatehgarh Sahib on Saturday on the occasion of 300th martyrdom day of the Sahibzadas. Baba Thakur Singh, who had taken over as the acting head of Damdami Taksal in June 1984 immediately after the infamous Operation Bluestar, died here today after a brief illness at a local private hospital. He was 89 . Baba Thakur Singh served as the acting Jathedar of the taksal for 20 years after the death of Sant Jarnail Singh Bhinderanwale in June 1984. Damdami Taksal, which was called “nursery of militancy” during the tenure of Sant Bhinderanwale, witnessed peaceful days under the moderate leadership of Baba Thakur Singh. Though he was a man of few words, yet he courted controversy by claiming that Sant Bhinderanwale had escaped during the Army operation in June 1984 and was “in high spirits”. Though Baba Thakur Singh, staunch supporter of this theory, is no more, Damdami Taksal is still divided over this controversy . Bhai Nirwair Singh and Bhai Major Singh told The Tribune that till his death, the Baba was of the view that Sant Bhinderanwale would come back some day to take over as the Jathedar of Damdami Taksal. However, those who believe that Sant Bhinderanwale was killed during Operation Bluestar are of the view that there won’t be any taker for this theory after the death of the Baba. Earlier eight radical organizations, working under the name of Shaheed Jarnail Singh and the Ghallughara Yaadgar Committee, had declared Sant Bhinderanwale a “martyr” at Akal Takht on June 6 last year. The Jathedar, Akal Takht, Giani Joginder Singh Vedanti, and senior functionaries of the SGPC were present when Sant Bhinderanwale was declared a ‘martyr’. An elder son of Sant Bhinderanwale, Bhai Isher Singh, had accepted ‘siropa’ from Jathedar Vedanti, giving a clear indication that his family had accepted the fact that the Sant was killed during Operation Bluestar. However, the ‘war of succession’ is likely to take place in Damdami Taksal following the death of the Baba. There are many aspirants for the post. The families of Sant Kartar Singh Bhinderanwale and Sant Jarnail Singh Bhinderanwale may vie for heading the seminary of the Sikhs, which is more than 300 years old. Earlier, an unsavoury situation had occurred when an aide of Sant Bhinderanwale, Bhai Ram Singh, claimed that Baba Thakur Singh had appointed him the 15th Jathedar of the taksal. Later, the Baba clarified that nobody could succeed Sant Bhinderanwale as he was still “alive”. Baba Takhur Singh was born in 1915 at Eechogill village, in Lahore (Pakistan). Both his parents were baptised, who recited prayers daily and had an unshakeable faith in the Sikh Gurus and Guru Granth Sahib .After the Partition, they came to India, in Sadaruala village near Makhu in Ferozepore district. He had served as Garveye (close associate) of Sant Kartar Singh Bhinderanwale for 22 years. He had stayed in the taksal for more than 70 years as he had joined the seminary of Sikhs at an early age . He has been associated with four heads of the taksal. When Sant Bhinderanwale launched the Dharm Yudh Morcha in July 1982, Baba Thakur Singh was asked to take care of Gurdwara Gurdarshan Parkash, Chowk Mehta. Many gurdwaras were built during his tenure as the acting Jathedar of the taksal, including Gurdwara Shaheed Ganj B-block where 13 Sikhs were killed during the Sikh-Nirankari clash. Warm welcome was accorded to “Sikhi sadak march”, organised by Shiromani Akali Dal (Amritsar) under the leadership of Mr Simranjit Singh Mann, president of the party, here last night by the Sikh sangat and activists of the SAD (A). The march, which commenced from Takht Sri Damdama Sahib, Talwandi Sabo, yesterday morning reached here at about 8-00 pm after passing through Maur, Mansa, Bhikhi, Cheema and Sunam, Tunga, Kularan and other villages. People received the march with enthusiasm and accorded welcome to it at various places. The march was led by Sri Guru Granth Sahib, placed in a flower bedecked palanquin. Panj Piaras also accompanied the march. A large number of devotees in more than 125 cars, trucks, buses and other vehicles took part in the march” reciting Gurbani and chanting “Satnam Sri Waheguru”. Besides Mr Simranjit Singh Mann, other prominent leaders who took part in the march included Mr Charan Singh Lohara, Bhai Ram Singh and Mr Jaskaran Singh, all general secretaries of the party; Mr Brinder Singh Mann, president of youth wing of the SAD (A); Mr Jeet Singh Alloarkh, Sangrur district president of the party; Mr Nirmal Singh Gharachon and Mr Sanmukh Singh Mokha, both SGPC members. Talking to mediapersons, Mr Simranjit Singh Mann invited the Sikh sangat to participate in the “Shaheedi Conference” to be organised by the SAD (A) on December 25 at Fatehgarh Sahib on the occasion of martyrdom tercentenary of four sons and mother of Sri Guru Gobind Singh. He also criticised the Shiromani Akali Dal for walking out of the Parliament along with the BJP on the issue of scrapping of POTA by the Central Government. He also paid tributes to the Sahibzadas of Sri Guru Gobind Singh on the occasion. Malta Boat Tragedy Probe Mission will soon publish a book about misdeeds of travel agents who got bogus visas to send youths abroad and about the role of various political parties for their alleged involvements in these rackets. This was stated by Mission chairman Balwant Singh Khera, while talking to newsmen here on Wednesday. He alleged that leaders of political parties like Shiromani Akali Dal and the Congress recommended young men for the grant of visas for travel abroad and got lakhs of rupees from them, whereas the travel agents got bogus visas issued. Both were exploiting and looting the young generation of Punjab, he alleged. He said Sikh Diwan Society Vancouver, Canada had written a letter to Shiromani Gurdwara Parbandhak Committee to send ‘Panj Piaras’ to Vancouver for celebration of Baisakhi on April 13,2001. Two Akali ministers, an SGPC member Tirlochan Singh and so called International Sikh Missionary S Balbir Singh Changiara hatched a conspiracy. Mr Khera alleged that the “Beed” of Guru Granth Sahib was procured from the SGPC along with faked armaments of Dashmesh Pita. Mr Khera alleged that fake Panj Piaras brought out Nagar Kirtan and celeberated Baisakhi day. He alleged that they deceived the religious-minded masses. Mr Khera further alleged that Shri Akal Takht Jathedar Joginder Singh Vedanti was shielding the culprits because they all belonged to Akali faction headed by former Chief Minister Parkash Singh Badal. He disclosed that he had filed a complaint in Delhi court for registration of cases against the culprits, and the court had reserved its decision till April 11,2005. Mr Khera said that Probe Mission may visit Vancouver to collect more facts and figures about the “scandal”. He claimed that Gurbax Singh Malhi, Federal Minister of Canada, had recommended visas for bogus Panj Piaras. He was debarred for issuing visas for some time. Greece, due to its geographical location on the one hand and being a member state of the European Union on the other, faces increased immigration pressure from aliens of various nationalities. Over the decades, it has served not only as a “paradise for illegal immigrants” but also as a launch pad for many who had been successful in making it to various destinations in North America. Illegal entrance to Greece, says a spokesman of the Hellenic (Greece) Police, mainly takes place from the land borders of Turkey (Evros river), Bulgaria, and Albania as well as through the territorial waters from Turkey. The main immigration pressure derives from citizens of countries of South-East Asia, including India, and the Balkans, says the spokesman. Hellenic Police is responsible for illegal entrance from land, while for checking illegal entrance from sea, the Coast Guards are responsible. While responding to a questionaire from The Tribune, the Hellenic Police held that during 2003, 48.066 foreigners were arrested for illegal entry and stay , while during the first eight-months of the current year, 23.706 aliens were arrested. Last year as many as 505 people were arrested for trafficking of illegal immigrants, while during the first eight months of this year, 345 were arrested. “Foreigners , who enter Greece illegally, are charged with a minimum of three months imprisonment and financial penalty of around 1.500 Euros. The penalties for trafficking, of illegal immigrants are , however, have become very heavy after amendment to the existing law," says the spokesman. And once an illegal immigrant or an alien enters Greece, he becomes safe. Sources in the Indian diaspora in Greece reveal that on an average 25,000 to 30,000 new immigrants from India arrive there every year. Of these nearly 50 per cent move out to other lucrative destinations in Europe. “Until the late 90s, Greece was used as a launch pad by Indian settlers in north America,” reveals another source, maintaining that since Greece had been an ancient shipping hub, it was used as a transit point. At that time shipping was the main mode of transport for those seeking jobs on alien lands. Then there were hardly any visa controls. Even now the Greece laws are liberal. Besides Greece, it is Italy, which is another land which has been very considerate to aliens. Every other year, the Italian Government had been regularising the stay of its aliens. Though Indian immigrants in Greece may not be that well off compared to their counterparts who settled in other European or North American countries, yet they have no regrets of settling in what is being described as “one of poorest European nations”. Music has a universality that cuts across language. A melody wafting through the air has the charm that is not the prerogative of a select few. Ustad Hussain Bakhsh Khan, the noted Pakistani vocalist, tells this to us in his mellow style, his Urdu striking a harmonious note. A fawn-colour shawl thrown over his shoulders, he makes himself comfortable in the big lounge. It is in the house of the Punjabi singer Hans Raj Hans that Ustad Bakhsh Khan, who is in city for the 129th Shree Baba Harballabh Sangeet Sammelan, is putting up. “My most memorable visit to this country was nearly two decades back. I was young at that time. Though I had proved my credentials as a vocalist, yet those were different times. Probably, I looked more of a college student than a vocalist and that too, a classical vocalist! It was the era of black and white television. Lata had invited me for a performance. My programme, that was compeered by Naushad, proved to be a big draw among the Mumbai film industry people. I still remember Naushad’s words - ‘You sing even better than what I had heard about you.’ And that was when my musical tryst with this country started,” says Ustad Bakhsh Khan, his eyes crinkling to travel back 20 years. “Though classical music is my forte, I am not averse to singing Sufiana kalaam. I think the younger generation is now becoming alive to classical music. In fact, I have a feeling that there is not so much disinclination towards classical music as has been publicised,” he says, adding that classical music has been the victim of politicisation from different quarters. Ustad Bakhsh Khan’s two sons - Suraj Khan and Chand Khan - are also here with him. Both these youngsters are vocalists in their own right. Already veterans in international performances, they consider music to be their mainstay. “Classical music rejuvenates your soul,” they add in unison. Punjab Chief Minister Amarinder Singh today extended his heartiest felicitation to all Punjabis on the eve of Christmas. In his message, the Chief Minister said the gospels of peace, love and compassion preached by Lord Jesus Christ were more relevant now then they were ever before. He also expressed hoped that the joyous occasions would help strengthen the bonds of universal brotherhood and communal harmony. Resham Singh, head constable, was killed when his service rifle went off accidentally in the police station here last night. He was cleaning the rifle to deposit it in the police station. He sustained bullet injury in his throat. His body has been sent to the Civil Hospital for post-mortem. Tension prevailed in the court complex here today for more than six hours when relatives of a girl, who had married against the wishes of her parents, allegedly made an attempt to take the girl back to her parents’ house. The incident took place in the morning when the relatives of the girl and also the police personnel gathered outside the district court. The couple, on the request of not publishing their names, said they were major and had married a few months ago at a gurdwara in Anandpur Sahib. The boy said that the parents of his wife were against the marriage. “She was rescued by the people who have come here for their case hearing when an attempt was made to take my wife forcibly”, he added. The court allowed the couple to remain in the courtroom till final orders and deputed a security person outside the courtroom. After hearing the plea of the counsel that the couple was apprehending threat to their lives, the court directed the SHO (city) to drop them safely at home in the evening. The court had also granted anticipatory bail to the couple till December 29 and directed the SHO concerned to file reply in the matter. The relatives of the girl claimed that the girl had not been married yet and was staying with the boy illegally. Director-General of Police, Punjab, A.A.Siddiqui has denied the news report that he was ignored while appointing SSPs in certain districts. Talking to mediapersons on the sidelines of the annual function of a school in Nakodar yesterday, the DGP said he was consulted before the appointments of SSPs. Addressing the function, he stressed the need for including traffic rules, human rights and their protection, and drug abuse as subjects in school syllabus. On the proposed “police commissionerate” system, he said the proposal could not be materialised because of some technical difficulties. More than 500 scientists from all over the world would participate in the 49th annual DAE solid state physics symposium-2004 starting at Guru Nanak Bhavan Auditorium of Guru Nanak Dev University here on December 26. The five-day symposium will be organised by the Department of Physics of the university in collaboration with the board of research in nuclear sciences, Department of Atomic Energy (DAE), Government of India. Dr R.K. Bedi, local convener of the symposium and Dean, faculty of sciences of the university, said Dr S.K. Sikka, Scientific Secretary, office of the Principal Scientific Adviser to the Government of India, would deliver the inaugural address, while Dr S.P. Singh, Vice-Chancellor, would preside over it. He said that scientists from the USA, France, Japan, Germany and South Korea, besides scientists from national institutions like Bhaba Atomic Research Centre, Mumbai, Tata Institute of Fundamental Research, Mumbai, National Laboratories, IITs, universities and the DAE, would address the symposium. The Guru Nanak Dev University Teachers Association (GNDUTA) today sent a communication to the Governor of Punjab, who is also Chancellor of the university, for seeking his immediate intervention to resolve the crisis in the Department of Sports Medicine and Physiotherapy. Dr Kuldip Singh, secretary, GNDUTA, urged the Governor to allow Dr G.S. Kang, a Reader, to take over as the next head of the department from January 1, as per university statute. The Governor is likely to discuss the matter of headship at the meeting proposed to be held on December 27.